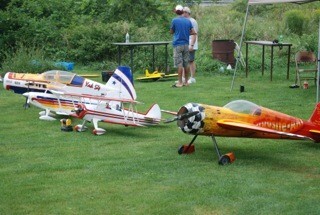 Rochester Modelers Club has been active in Rochester, New Hampshire, for over 20 years at various locations. For the last 19 years our club field has been generously hosted by Waste Management. We greatly appreciate their support through the years and the club would not be what it is today without them. The Rochester Modelers Club is an Academy of Model Aeronautics (AMA #3558) club and flying site and adheres to AMA's National Model Aircraft Safety Code. The club has had great membership with around 35 members participating over the years sharing their talents in flying and building--but most importantly--just having a great time. We have monthly Sunday meetings as well as several flying events throughout the year. Our events have contests to test your flying skills if you would like, but our primary goal is to get together just for the sake of enjoying a great hobby with friends. Our club aims to give members and newcomers a chance to meet other model aircraft flyers and to encourage learning new skills, no matter what type of aircraft they fly. The Rochester Modelers Club's annual membership fee is $45 and is due at the first meeting of each year. Our monthly meetings are attended by members and non-members by invitation. Please contact the club if you are interested in attending a meeting as a guest or if you would like to learn more about our club. Click here for more info. on RMC club membership and to download an application.